It’s hard to blame a horse for failing to enjoy his deworming paste; it doesn’t exactly look like good eats. Although deworming companies have put great effort into making the medicine more palatable, some horses simply haven’t read the memo and refuse to have anything to do with dewormers. A horse that is reluctant to take his dewormer can be frustrating—pointing his head skyward as you teeter on your tiptoes, endeavoring to squirt paste into his mouth. Even if you do get that dewormer out of the tube, it seems that more of it ends up on you than in your horse’s mouth. If you’re ready to put an end to this escapade once and for all, try these deworming tips. Turn a bad experience with deworming around by employing the bait and switch method. Fill an empty deworming tube (cleaned), with applesauce or corn syrup. 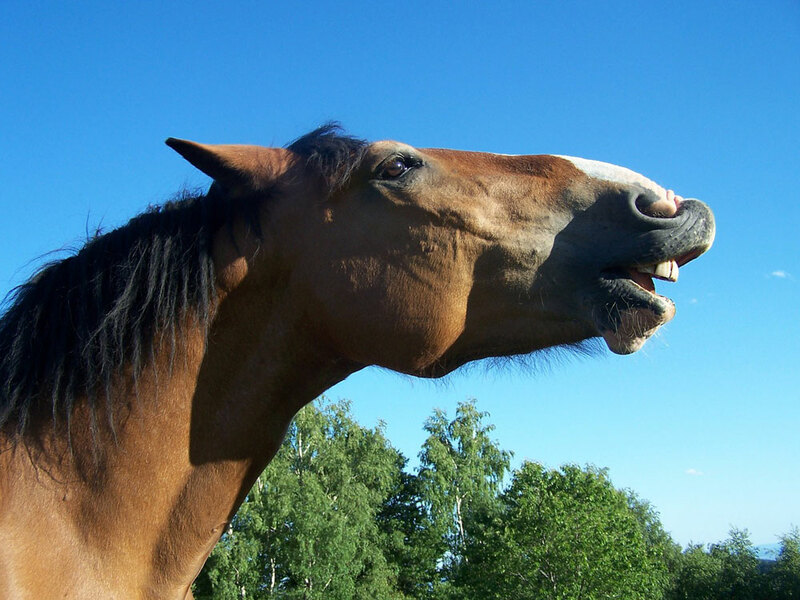 Place the tube into your horse’s interdental space—where the bit normally sits – pointing to the back of his tongue, and press the plunger, releasing the tasty treat into his mouth. Repeat the process daily until your horse happily accepts the applesauce. Now, try it with the dewormer. To keep your horse guessing, occasionally administer your applesauce trick in between dewormings. Another method you can try comes from equine behaviorist Linda Tellington-Jones. According to Tellington-Jones, the mouth, gums and muzzle are full of acupressure points that work on the limbic system, which is the part of the brain and nervous system that affects emotions. Rubbing the mouth, lips and gums may help your headshy horse overcome this behavior. The Easy Wormer is a nifty dosing gadget that fits on the horse like a bridle. The “bit” has a hollow mouthpiece that allows you to deliver the medication from the outside of the bit. Squeeze the dewormer into the bit mouthpiece, and then leave the Easy Wormer on for a few moments to make sure the horse swallows the entire dose. It also works for other medications. Taking time to make the deworming process easy for your horse is worth the effort. Soon the job will take moments and you and your horse will be less frustrated. Best of all, you’ll be secure in the knowledge that your horse is getting the correct dose of dewormer. I think the article was very helpful, but my horses are very aware of any tube and suddenly become very mouth shy. I’ve tried to desensitive them but they always know when it’s the real thing. I wish you’d address this? Another way to worm a horse that’s a bit head shy or just plain dose not allow you to put a tube of gunk in their mouth can be done as follows. You will need 2 lead ropes, one that is thin. Clip the ropes on the bottom ring of their halter. Slide the thin one in the horses mouth like a bit and hold both ropes so that the one in the mouth wont slide out but not so tight its pulling on their jaws. Once you have the ropes in your one hand hide the tube as best you can in your free hand and place the plunger where the mouth rope is making them “smile” (they think that its the rope moving around and not a wormer/med tube.) And squeeze it in. Hose the “use” rope off and allow it to go back in your leadrope rotation so it dose not taste or smell like wormer for the next time. My horse is very head shy, and I simply put the dose of wormer in a folded piece of bread. Is there any reason why this would not be effective? I have one horse that I bought as an adult, that will not have anything to do with worming, she gets very dangerous with her head tossing to avoid it altogether. So I found if I core an apple, and put the wormer in that empty space she’s been had. Then I’ll give her one more apple without it after she finished the first. I have a 15 yr old Kentucky Mt., I have to put his wormer in his bucket with grain, bran, apple sauce, apples, shredded carrots, a little cinnamon, Karo syrup, or vanilla. He eats it right up and doesn’t leave a drop! This mash works great for giving pills too. These are great ideas and worked on my adult draft horse that I recently bought and refused the dewormer. She is very head-strong and at her size, I needed options. Thanks!! Carrots split down the middle with the dewormer or 2 apple treats with the dewormer in the middle worked great! My Cobb pony has never turned his nose up about food until I squeezed the deworming dosage in his feed. He spit every bite of food up and refused to eat it. I had to get another bucket of feed without the dewormer.